Share of the mall-based retailer gained in sympathy with peers and on hopes of a strong first-quarter earnings report. Shares of Francesca Holdings Corporation (NASDAQ:FRAN) gained last month though there was little news out on the company. Instead, investors seemed to send shares of the specialty retailer higher on a bullish wave in retail stocks, which peaked when Macy's (NYSE:M) released its first-quarter earnings report. The market also seemed to anticipate Francesca's own report at the beginning of June. We saw a similar effect with Ascena Retail Group (NASDAQ:ASNA), another beaten-down stock that jumped 47% last month. The mall-based retailer came into the month struggling, as the stock had fallen more than 50% in the past year, but investors were hopeful that a strong economy and a surprising turnaround in the retail sector would lift the company's prospects. Francesca's best day of the month came on May 16. The stock gained 6.2% in the wake of strong results from Macy's, which is often seen as a proxy for the larger retail industry, as the department-store chain sells everything from apparel and home goods to cosmetics and jewelry -- similar to what Francesca's offers on a boutique level. And Macy's occupies a variety of real estate formats, from malls to prominent downtown locations. Macy's said comparable sales were up nearly 4% and its adjusted earnings per share more than tripled in the period; it also raised its earnings guidance. 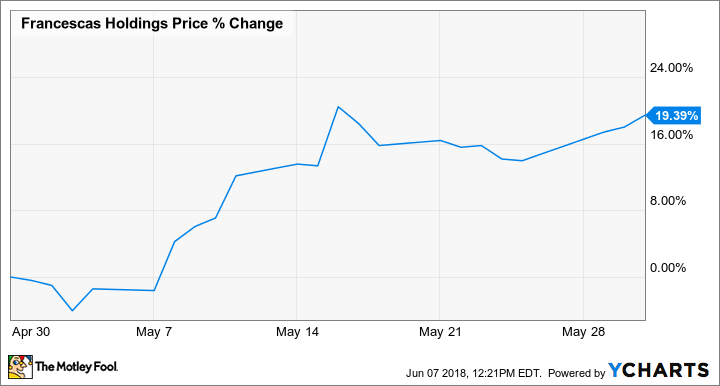 When Francesca reported first-quarter earnings on June 5, the stock actually tumbled in the morning, much like Ascena after its report. But like its fellow struggling retailer, Francesca bounced back and finished the session up 8%. In the first quarter, comparable sales at Francesca's plunged 16% due to a decline in traffic, and overall revenue fell 7% to $100.4 million, missing estimates of $101 million. Gross margin compressed 700 basis points to 38.2%, due to a deleveraging of occupancy costs and lower merchandise margin. On the bottom line, Francesca posted a loss per share of $0.11, down from a profit of $0.12 the year before, though that matched estimates -- the company had forecast a weak quarter as it transitions to a new merchandise assortment. However, management maintained its guidance for the full year, calling for earnings per share of $0.53 to $0.63, with comps turning positive in the second half of the year. If the company can hit those goals, the recent gains seem justified.